Purlins are generally lightweight and channel-shaped and are used to span roof trusses. 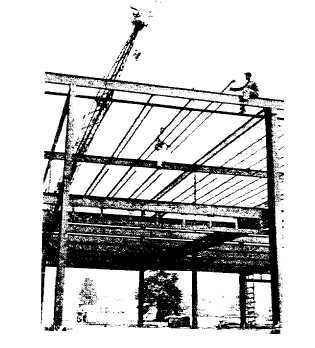 Purlins receive the steel or other type of decking, as shown in figure 3-26, and are installed with the legs of the channel facing outward or down the slope of the roof. The purlins installed at the ridge of a gabled roof are referred to as RIDGE STRUTS. The purlin units are placed back to back at the ridge and tied together with steel plates or threaded rods, as illustrated in figure 3-27. The sides of a structure are often framed with girts. These members are attached to the columns horizontally (fig. 3-28). The girts are also channels, generally the same size and 'shape as roof purlins. Siding material is attached directly to the girts. Figure 3-20. - Installing bar Joists girder to girder. Figure 3-21. 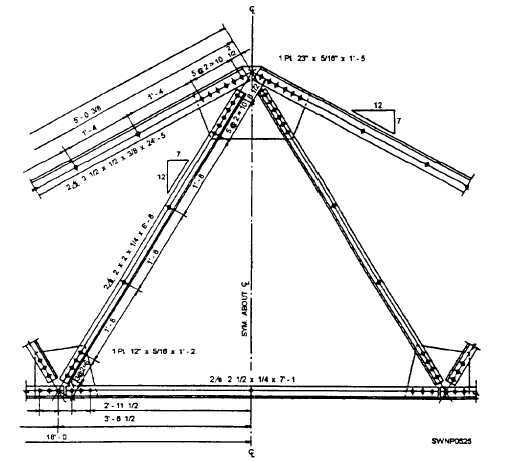 - Steel truss fabricated from angle-shaped members.